On this date in 1938, California debuted the latest in killing technology when its brand new gas chamber consumed Robert Lee Cannon and Albert Kessel for the previous year’s riot in Folsom Prison. Already near 15 years in service in Nevada and previously mammal-tested in the Golden State, the gas chamber made California’s gallows a thing of the past. They were the five survivors of a bloody rising at Folsom in September 1937 that had killed Warden Clarence Larkin, plus a prison guard and two inmates. And they earned thereby the distinction of being blogged about in the 21st century as Californian pioneers. Prison attendants, used to watching men die, said the exhibition sickened them. It led almost immediately to a movement to have the new law repealed and hanging reinstuted as the method of capital punishment in this State. The Times‘ “Daily Mirror” history blog helpfully provides several of the eyewitness reactions (along with ancient newsprint pictures of the condemned). Kessell’s death was visibly unpleasant. He “appeared to be trying to hold his breath. He was rigid and his hands gripped the arms of his chair as the gas hit him. He gasped: ‘It’s bad! '” Cannon’s seems to have been less so. But the real source of spectator revulsion was the audience’s aesthetic experience — in this case, of excessively prolonged and intimate proximity to the dying men. What several witnesses said made today’s executions so terrible was the fact that the condemned men were not masked or blindfolded and that it took so long,* from the time they entered the chamber to be strapped into the chairs until they were pronounced dead. The movement to restore the gallows never got, er, off the ground; California kept gassing condemned men and women into the 1990’s, when it switched to lethal injection. 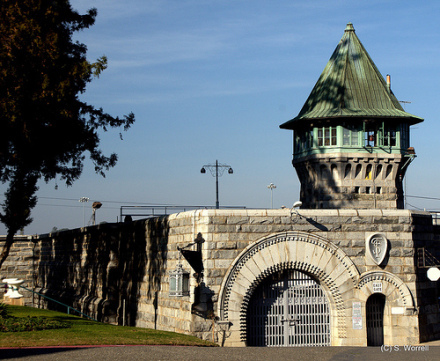 Killed in San Quentin for crimes in Folsom? Here’s the mandatory Johnny Cash callout. * A couple of minutes to strap down, and another 16 minutes from the start of the execution until death was pronounced. This same newspaper article said hangings clocked in at under 15 minutes for the entire procedure. Everything is relative, of course. Renowned British hangman Albert Pierrepoint had to conduct a few executions for the U.S. military, and he found the American hanging ritual to be intolerably prolonged and personal compared to his baseline assumption.